As online retail giant Amazon continues to raise the bar on how fast customers expect to have an ordered item in hand, it is becoming clear that getting goods to customers as quickly as possible—in the most convenient way possible—is swiftly emerging as one of the most important components to attracting and retaining retail customers. Retailers with physical locations are increasingly looking toward IoT- enabled software services that can help them maximize their physical storefronts, and profitably bridge the gap between offline locations and their online presence. A leader in this field is Curbside, whose mobile application enables customers to find, buy and pick up products from stores—more quickly and easily than ever before. Boasting a team made up of alumni of forward-thinking Silicon Valley companies like Apple, Box, eBay and Google, the Palo Alto-based company uses its technology to connect online commerce to local retail, providing software that helps get its clients’ products to their customers at the exact moment they’re ready for them. Its software enables retailers with brick-and-mortar locations to transform how its customers shop by leveraging mobile commerce experiences that make an impact, and keep bringing customers back. Curbside partners with retailers across the country to create purchase experiences that impress their customers, specifically, getting desired products into their hands in under an hour—while avoiding the hassle of parking and lines. So far, there’s no place you can drive to in your neighborhood where Amazon can match that. Curbside counts numerous Fortune 100 retailers as their customers, including CVS, H.E.B, Nordstrom, Sephora, Westfield, Yelp and many more. The company’s software powers mobile transactions for thousands of locations nationwide. So, how does it work exactly? The company’s offering focuses on four primary components: Curbside CONNECT™, Curbside FULFILL™, Curbside ARRIVE™ and Curbside ENGAGE™. Curbside CONNECT connects retail stores to the continually growing audience of online shoppers, delivering web and mobile experiences that beat pure-play e-commerce. The technology powers e-commerce for brick-and-mortar stores, providing customers with an immediate, convenient way to shop. Customers can easily access local pricing and deals, and integrated predictive inventory that allows them to conveniently buy and get what they need within an hour at nearby stores. Curbside FULFILL streamlines order workflow, ensuring store associates can fill orders quickly, much to the delight of customers arriving for their pickup. The Curbside Merchant Console, a mobile solution developed in close collaboration with store operations experts at CVS and other merchants, brings tremendous efficiency to the pick/pack process. FULFILL connects online orders with physical stores and allows associates to checkout via existing POS systems with no integration. Store associates scan or swipe at POS and orders are credited to stores. Curbside’s cloud-based solution is secure and PCI DSS compliant. Curbside ARRIVE, a cloud-based arrival prediction technology that plugs into retailers’ mobile apps, notifies stores just as customers are approaching, making it possible to ensure everything is ready inside the store at the appropriate time. Already running on millions of smartphones, ARRIVE gathers location information from customer devices and sends it to the cloud where it is processed and delivered to the retailer’s backend platforms to improve delivery timing. The technology—using updated traffic data and historical approach patterns—sends an alert to the store when customers are minutes away. 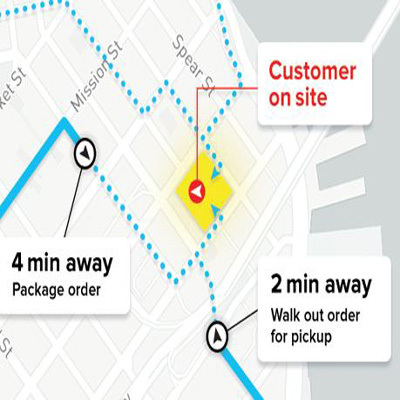 These time-based notifications allow retailers to use these alerts as a prompt to prepare the order so it is ready to be delivered car-side when the customer arrives. Curbside ENGAGE helps retailers engage with their on-the-go shoppers more effectively. Smartphones have changed the buying habits of many customers, moving shoppers from purchasing on e-commerce sites to a mobile-only experience. Curbside ENGAGE is bringing these technology-loving shoppers back to brick-and-mortar stores. ENGAGE enables retailers to extend their digital store to other familiar apps. Its partnership with popular apps like Yelp makes retailers’ local inventory shoppable for millions of mobile customers. The entire Curbside platform has proven extremely successfully for many large-scale retailers across the country. CVS had so much success leveraging the platform to launch their buy online and pickup program that it went from eight pilot stores to 4000-plus store locations nationwide within six months. The company is now fully managing the entire experience, from online commerce to in-store fulfillment. Learn more about how IoT-enabled offerings like Curbside provide retailers with a complete platform of products geared towards creating the scalable, omni-channel shopping experience today’s customers demand. Learn about The Retail Revolution. Find out Why the Internet of Things Is What Retail Needs Now.